The wall space in our master bathroom is limited, and the only option for a 24″ towel bar was either over the toilet or mounted on the shower glass, neither of which is a great option. I don’t know about you, but I haven’t met very many men who will trouble themselves to hang their towel nicely on the bar. Hooks solve the space problem and the disorderly towel problem very nicely. On our vanity wall, both the mirrors and cabinet knobs have a golden brushed brass finish. I wanted to bring some of that brass towards the shower where all of the fixtures were chrome, so I decided that brass hooks were the answer. I’ve been looking all over the internet for the perfect brass hooks, and I eventually settled on the industrial style monogram hooks from Anthropologie that are pictured on my mood board. However, when they arrived, I was really disappointed in the finish. I like rustic and industrial, but the finish on the hooks had dark smears and visible thumbprints, so I sent them back and started looking for other options. 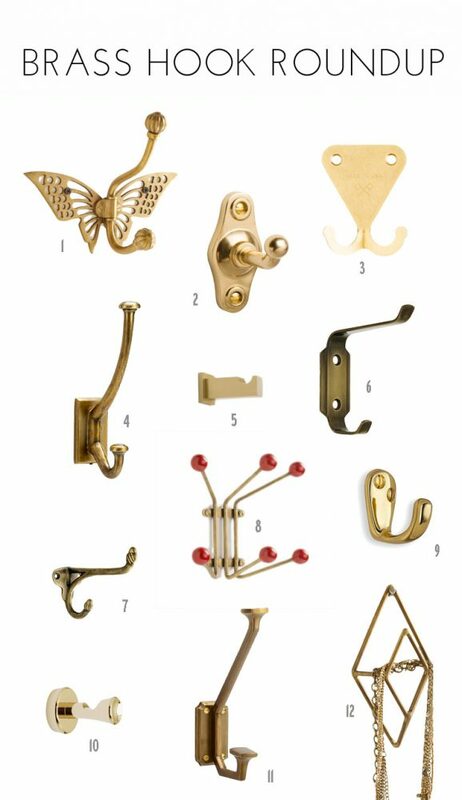 I found some really great brass hooks, and I have my definite favorites from the ones I’ve included below. We’re headed to San Francisco soon for a little vacation, so I’m going to try to check them out in person before I commit. And, maybe I’ll find my original choice with a better finish at Anthropologie. Fingers crossed.